Vancouver, British Columbia . . .
world-renowned for its breathtaking natural setting and a cosmopolitan flair, complimented by beautiful parks and gardens, beaches, and a variety of cultural and recreational facilities. Whether the visitor chooses to laze on one of the many sandy beaches, enjoy the wide-open spaces, the majestic British Columbia rainforest and rugged West Coast mountains, join in the beach volleyball games or windsurf on the ocean, Vancouver's prime location is perfect for those who enjoy the outdoors. In addition to the cities scenic location, visitors also enjoy beautiful gardens, the seawall and world famous Stanley Park, and the nearly 200 city parks. 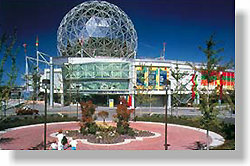 For family fun there's the Vancouver Aquarium Marine Science Centre, Science World, CN Imax Theatre, the Miniature Train, and the Kids Only M arket. Culture buffs can enjoy the entertainment at the many theatres including the Queen Elizabeth, Orpheum, and Vancouver Playhouse theatres. There is also the Sun Yat-Sen Classical Chinese Garden, the Vancouver Art Gallery, the Vancouver Symphony, Ballet BC, and hundreds of heritage sites including the Gastown and Chinatown historic areas. Vancouver also offers world-class entertainment, fantastic cuisine, and malls and individual stores representing the many cultures of the city. Within a 30 minute drive in any direction you arrive at one of the surrounding southwestern British Columbia communities which have much to offer those interested in recreation, shopping or culture. Local mountains offer winter skiing and summer hiking, biking and exploring. Nearby North Vancouver offers the Capilano Suspension Bridge, the Salmon Hatchery, Seymour Demonstration Forest, Lynn Canyon Park & Ecology Centre and Cleveland Dam. Take the skyride to the top of Grouse Mountain and view the entire British Columbia lower mainland. To the east of Vancouver, BC, visitors to Burnaby can enjoy the Burnaby Lake wildlife sanctuary, Fraser Foreshore Park or Deer Lake Park. All the surrounding communities can offer excellent shopping, sightseeing spots, recreation opportunities and facilities plus first class accommodations. 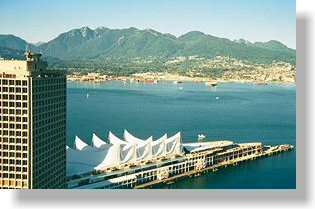 With a population of approximately 550,000, Vancouver lies in a region of more than 2 million people. It is the largest city in the province of British Columbia, (third largest in Canada), and is located in the southwest corner of the province covering an area of 113 sq. km that is surrounded by water on three sides and by the Coast Range Mountains. Vancouver has not only been voted the most beautiful city in Canada, it has also been voted the number one city in the world to live. 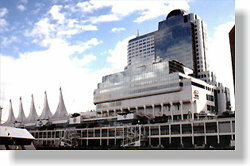 Vancouver, and the BC lower mainland area, has been inhabited for thousands of years by first nations peoples. Europeans first explored the area in the 1770s and 1780s. Captain George Vancouver sailed into Burrard Inlet in 1792 while searching for the legendary Northwest Passage. Fur traders followed, and in 1858 prospectors came in search of gold on the tributaries of the Fraser River. 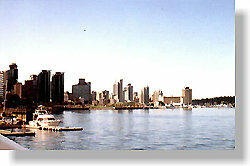 The area was rapidly settled, and the City of Vancouver was incorporated in 1886. Climate - The areas climate is one of the mildest in Canada with temperatures averaging 3?C in January and 18?C in July. The average annual precipitation is 1,219 mm, with most rainfall occurring in winter. Come join us for the 2010 Sea To Sky Winter Olympics!